After the human race expanded its territory by exploring space, the pollution on earth became too great and the planet began to die. A terrorist group named Gulfer has declared war on human kind and is bent on their destruction. But a humanoid race has decided to save the earth by giving the last human hero the TOZ, an advanced weapon that adapts to enemy technology. The humanoid race told them that if they defeat the terrorists, they will restore their planet. So good luck, hero. 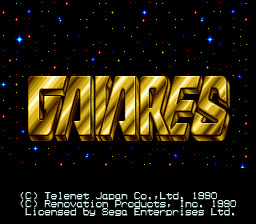 Gaiares is a fun side-scrolling shooter much like Contra. It has good graphics for its time, i.e. the background looks awesome with the stars and landmasses you fly around. Also awesome music that's kinda catchy. Although the gameplay is rather hard, the game itself is fun and worth playing. In Gaiares, you fly around in your ship trying to defeat the enemy ships. Be careful, because if you get hit once it's all over, unless you have a shield on, then you get three hits. You will venture into battle armed with your ship's weapons and the TOZ, which lets you steal enemy technology by docking with them. There are upgrades such as bombs that clear the screen of enemies, and shields which are your only defense (to name a few), however these upgrade are only temporary. The levels of this game are rather different in that it's a constant level with bosses placed within it. After defeating the bosses, you continue to the rest of the game without skipping a beat. If you like space shooters, this one is definitely worth your time.